There is no better way to wake up, than to jump into a cool, deep, clear sea! Especially if there is nobody else around, or just a couple of small fishing boats in the distance. I don't know how much our girls slept the first evening, being in a new exciting environment, with all the smells and sounds of the beach and the forest behind. They were certainly awake when I woke up. Although there is natural shade on this beach, for a few hours in the middle of the day it is pretty hard going, so we tried to make the most of the morning cool. After a swim, and a quick coffee in the taverna, we walked a little way up the beach for another swim and a bit of exploring. 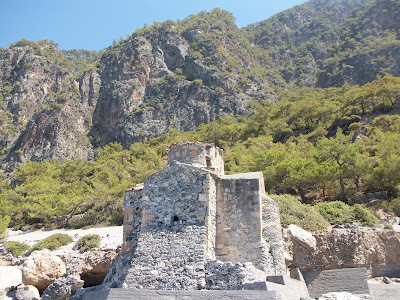 I had wanted to see the church of Agios Pavlos since reading about it a couple of years ago, and it absolutely lived up to my expectations. It is so beautifully built that it almost fades into the scenery behind, nestling on the edge of the pine forest, right on the beach itself. It has been constructed from materials found nearby, so it suit its environs perfectly (you can even see beach pebbles in the exposed vault). The church was originally constructed in the 10-11th century, supposedly by Agios Ioannis Xenos (Saint John the Stranger) in commemoration of the Apostle Paul's visit to the area. It is a cruciform church, with a dome. As the church is exposed to the elements, the wall paintings have suffered, and large sections are blackened with mould, or missing altogether. Those that remain, however, are fantastic. I have been trying to find out what the paintings depict, and I'm still not sure (please let me know in the comments box below if you have any information). 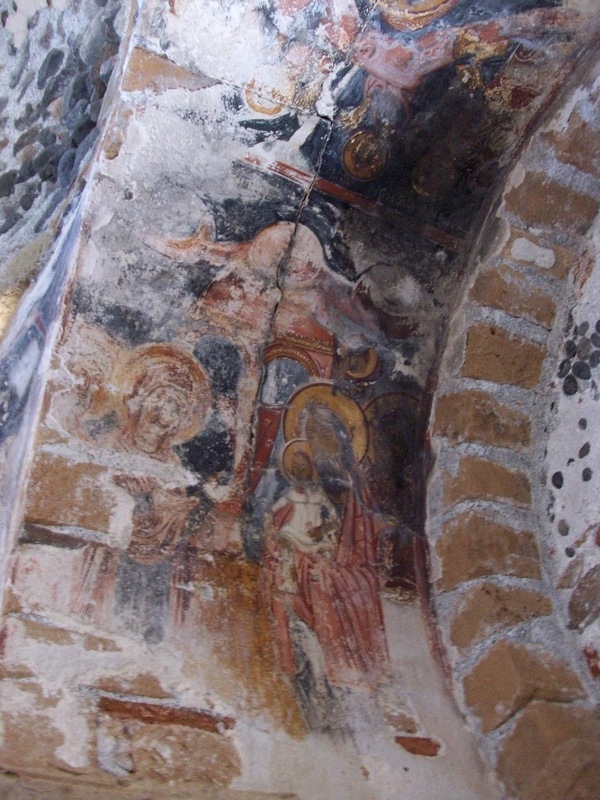 One of the remaining scenes shows a bearded male figure, with a halo, holding the baby Jesus (the first photo above). I had not seen this before in Byzantine iconography. The only parallel I could find is a 14th century icon showing the Presentation of Christ in the Temple, where the Virgin presents Christ to Simeon for rites of purification. I think the second photo shows the Apostle Paul holding a book or letter. These paintings are said to be from the 13th century. Of course, we left the dogs outside in the shade while we went in to the church. 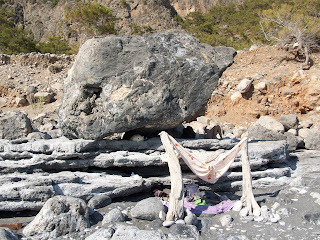 By this time it was kind of lunchtime, so we headed to the taverna, again, and stayed there until we saw shade from the rocks by our tent. 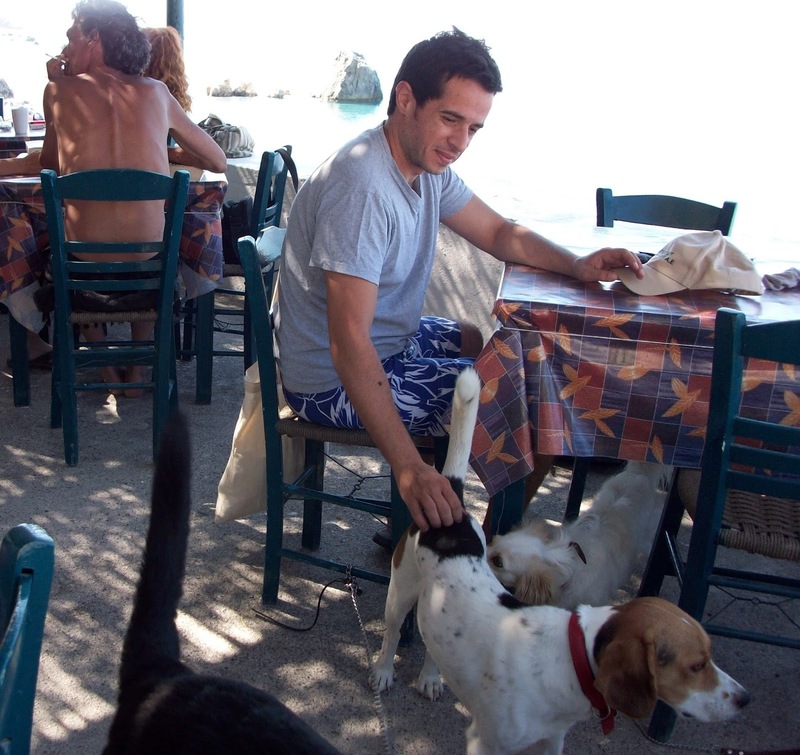 The owners of the taverna were more than happy for our dogs to come and sit with us. They came over to pet them and play with them, and there were at least two other groups who had brought their dogs with them too. It is a very dog-friendly place. The afternoon passed easily enough, eating, drinking, finally slinking off to the rocks to lie down, a bit more swimming, playing with the dogs... As soon as it was cool enough, we had a longer walk up the beach. We reached the end of the bay, where the beach comes to an end and you have to climb up the sand dunes to the path to continue round. Then back, once again, to the taverna for an evening meal. 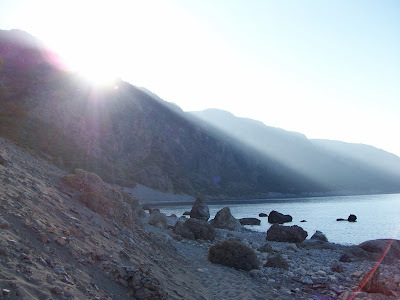 The next morning we woke early to beat the sun, and set off back to Agia Roumeli along the E4. With slightly less to carry, and in the daylight, this walk seemed much easier, although I wouldn't have wanted to do it later in the day. With the morning sun it was glorious. 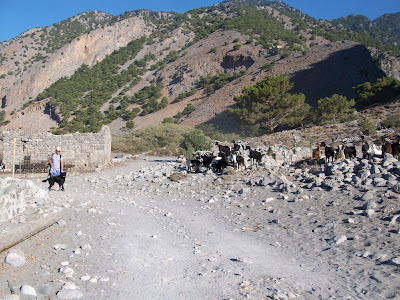 We had one last altercation with the goats, and found ourselves sitting in a taverna by the harbour at Agia Roumeli, waiting for the 11 o' clock ferry to take us home. I really enjoyed this trip. 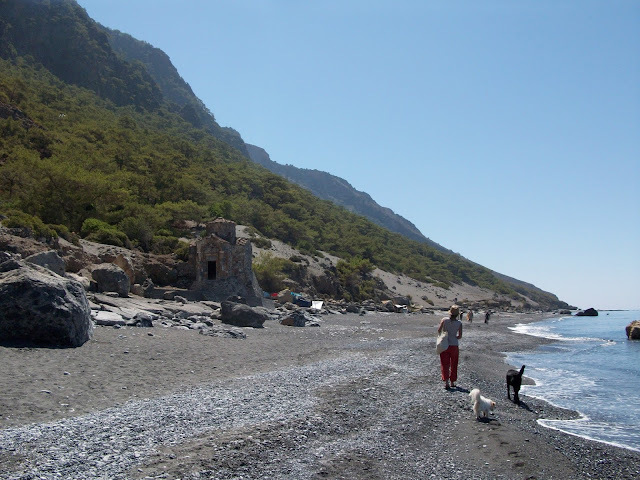 I loved the journey there - how the landscape changes so much (starting from Heraklio) from the busy, developed north coast, through the wild mountains inland, to the bare, rocky coast line with small seaside villages and coves, to the pine forests and long, deserted beaches. I loved the boat ride, and the views, and watching the coastline from the sea. I really liked the sense of adventure, hiking to an unknown beach as it was getting dark. 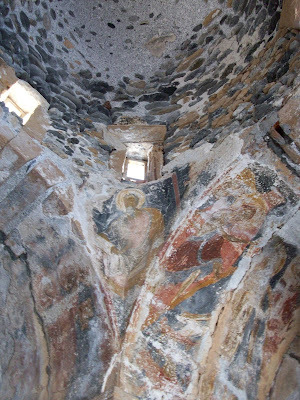 And I loved the beautiful church with its incredible wall paintings, built in the middle of nowhere. I would say, however, that it really takes quite an effort to get there (or else quite a lot of money), and if isolated beaches, and carrying your provisions, and hiking are not really your thing, then this probably isn't the trip for you. Wasps. We woke up, the first morning, to the sound of snapping jaws. Our two dogs were sitting outside our tent, trying to catch wasps... with their mouths. Thankfully, they didn't manage. But in the morning, they were everywhere. They particularly liked it when we came back wet from the sea, and were swarming around us quite ferociously. There were also wasps in the (hole in the floor) toilets at the taverna. They disappeared as soon as the sun came up, but were back to pester us the following morning. I suppose this is worse at certain times of the year. Rubbish. There is no waste disposal. The taverna discourages guests from throwing their rubbish there, as everything has to be burned or ferried back to Agia Roumeli. 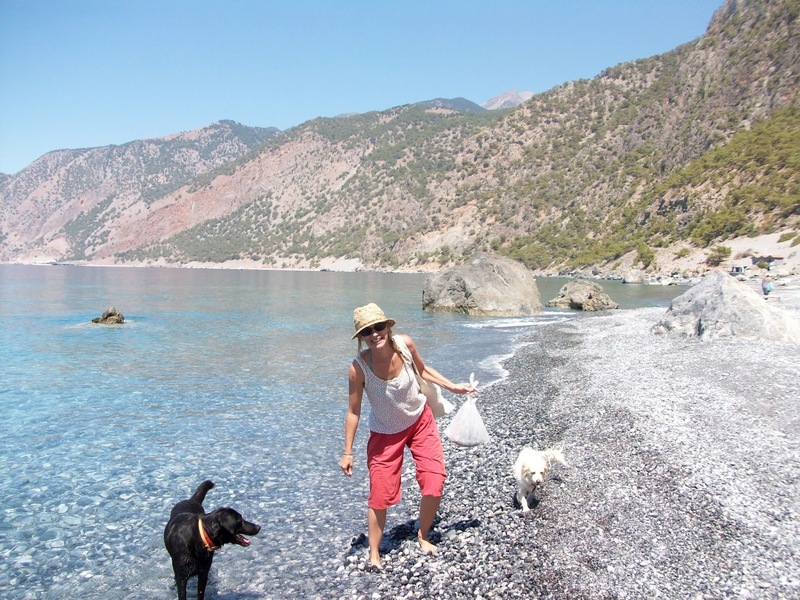 I spent a lot of my time on the beach clutching plastic bags of dog poo, which I didn't want to leave on the beach, but didn't especially want to pack in my backpack and carry around with me. I like the idea that you carry out what you carry in....but it's good to have this in mind when you pack. 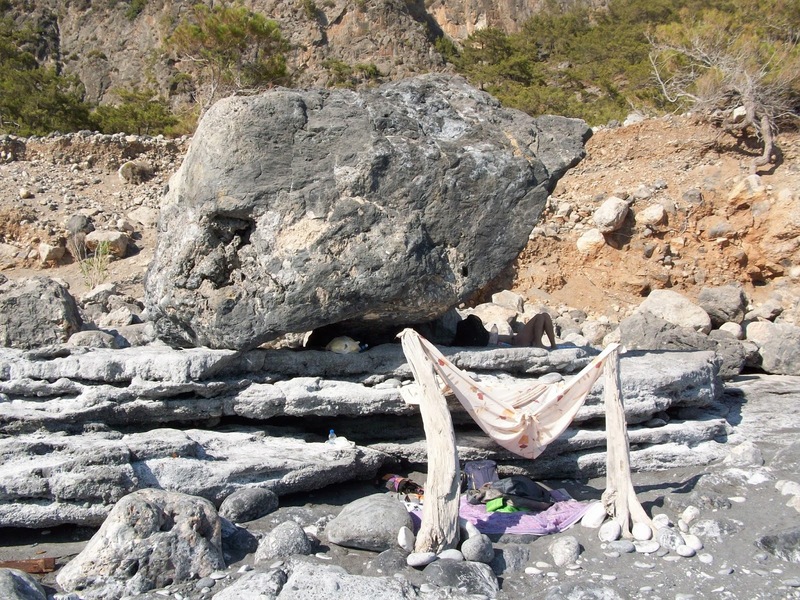 For example, the essentials, one bottle of raki may be less effort to carry (both ways) rather than cans of beer or bottles of wine. The taverna ships out empty glass bottles. Heat. I watched quite a few brave people hiking, in both directions, past the beach of Agios Pavlos. I was impressed. For me, once the sun was up, I was stuck on the beach until dusk. 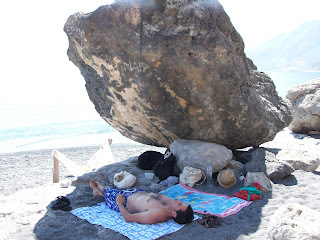 Although lazy days hiding from the sun in the taverna, and behind rocks, and cooling off in the sea can be wonderful, you should know in advance that this is probably what you'll be doing. I also worried about my dogs' feet. 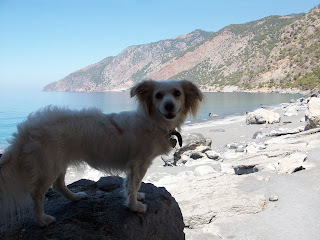 Betty, in particular, is quite sensitive to heat, and doesn't like the sea, so I ended up carrying her whenever we made a dash from the sea to the shade, or to the taverna. Cost. It's not that easy to pop to the shops to pick up a cheesepie or packet of crisps, so you end up eating and drinking at the taverna, unless you are very well organised. I thought the prices there were reasonable, especially as they have to ferry in all their provisions. They also had quite a reasonable menu, with one or two specials, and the usual pork chops, chicken etc. If you are eating there 2-3 times per day, however, it would start to get a bit pricey. A final note: I was filling water bottles from the bathroom at the taverna, for our dogs to drink. When I accidentally tasted it myself, I realised it was near enough pure sea water. I recommend that you buy bottled water for your dogs, or carry it with you from elsewhere. 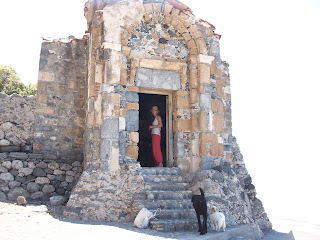 I'm pretty sure this is why Sage was sick on the floor when we got to Agia Roumeli...although this is a bit of a running theme with expeditions with my dog.